Wearing her protective goggles and blue booties, a search dog named Frida became a symbol of hope after the devastating 7.1 earthquake in Mexico City last September. The Labrador Retriever captured hearts around the world as she worked to find survivors. 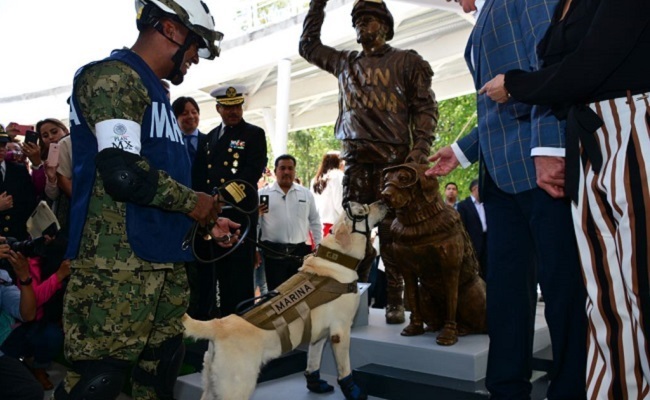 During her career as a disaster rescue dog with the Mexican Navy’s (SEMAR) Canine Unit, Frida – she’s named after the artist Frida Kahlo — has helped find 53 survivors and victims, and not only in Mexico. She found 12 survivors of the Haiti earthquake in 2010. Two years later, she found the bodies of 42 people who were killed by a mudslide in Guatemala. The dogs in the SEMAR Canine Unit are able to reach areas that humans can’t, including spaces less than 20 inches high. When they find a victim who’s alive, the dogs bark to alert their handlers. Otherwise, they stop and slowly approach the body. SEMAR Canine Unit rescue dogs, like Frida, begin training when they are just two months old. The skills the dogs exhibit during their training determine whether they will work as rescue dogs or as detection dogs for narcotics or explosives. Another of Frida’s trainers, Emmanuel Hernandez, told the Associated Press last year that Frida’s qualities as a good search dog were apparent early on. She was docile, had a good hunting instinct and a strong sense of smell. Frida received hero status for her actions during the aftermath of the Mexico City earthquake. Two months later, she was honored with the Pagés Llergo prize, which is usually awarded to academics, students and journalists. Last year the recipients also included civilians and social leaders who helped in earthquake relief efforts. Frida is also featured in a colorful mural on the side of a building in the Mexico City neighborhood of Roma Norte, which was hit hard by the earthquake. “She is a symbol of strength and hope in these times, and I painted her to bring positivity to Roma Norte, a very affected area of the city that I love,” California artist Celeste Byers, who created the mural with graffiti artist Uneg, said in October 2017. The Mexican airline Volaris plane honored Frida by putting her image on the side of an airbus. And now, Frida has been immortalized along with Arauz in a new bronze statue. Made from donated keys, the statue in Puebla City shows Frida wearing her famous goggles and vest, ready to go to work alongside Arauz. Not too surprisingly, during the unveiling ceremony, Frida could be seen sniffing out her likeness. “Memorable symbols of the strength Mexicans can have when we decide to come together for great causes,” reads the plaque on the statue. Now eight years old, Frida continues to do her memorable, life-saving work. In the not-too-distant future, she will serve as a mentor to up-and-coming hero dogs, like Evil and Echo, two Belgian Malinois who helped her in the aftermath of the Mexico City earthquake by entering collapsed buildings before she did. If they found someone, Frida would enter and spend no longer than 20 minutes inside the building. When it’s time for Frida to retire, she’ll spend the rest of her life with someone from SEMAR — and Hernandez hopes it’s him.